The Sunny Health & Fitness Indoor Cycling Bike is a very affordable spin bike and it looks like a great option for someone on a budget looking to work on their fitness and weight loss. 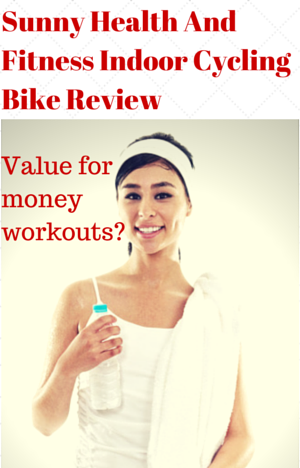 In our review we take a look at whether or not it provides good value for your money and whether or not you get a good workout. It is a bike that majors on providing that workout without too many frills. But it does have a computer that provides feedback on your individual workout sessions. This is a great feature for a bike at this price. As you’d expect it doesn’t have all the features of a bike costing much more but the important thing is whether you can get a good workout from it at a fraction of the cost of other models, can have a comfortable ride, can adjust the resistance easily and that if it is durable and doesn’t move about when you are pedaling hard. The bike is well made with a frame that is constructed of steel. You can use it both sitting and standing on the pedals like you do with the much more expensive gym bikes. It doesn’t move around when being used even at high speeds and in a standing position. This is all surprising -in a good way – especially considering its cost. The seat is held in tight and there is no movement from it even when it is fully extended for taller users. You can just get on with your workout. The flywheel weighs 22 lbs which is below the minimum normally recommended for spin bikes. At this weight you would expect the pedaling motion to feel a bit choppy and be too easy at lower resistance levels and when you first get on the bike. Having said that, most users are happy with the way the bike feels and don’t notice these shortcomings associated with lighter flywheels. Someone who is just looking for a way to get fit at home and lose weight is not likely to have those sorts of problems with the bike. It is going to be the serious spinners and cyclists that are more likely to have more problems adapting to the bike as they are going to be used to a smooth ride given by outdoor bikes and upscale spinners. It will be more apparent at the top speeds and when they are just starting their workout. There is not too much maintenance required on an ongoing basis to keep the bike up and running. The instruction manual recommends what you should do on a regular basis and will normally only take a few minutes. This is no more than you would expect do for any piece of exercise equipment that has moving parts. This involves checking the nut and bolts are tight each time beforer use, lubricating the chain as required and changing the friction pad as needed. The seat can be adjusted in four directions to cater for people of different heights – backwards, forwards, upwards and downwards. The handlebars can’t be moved which could restrict the minimum or maximum height of people who can use it comfortably. The result is that at the taller and shorter end of the height scale users may need to stretch too far to reach the handlebars. The company has not given any guidelines on the heights of the people this bike is designed to be used by. However, if you are over 5 foot 10 inches you are likely to feel cramped and not using the best form when riding (which could lead to overuse injury). Some people over this height are fine with the bike but most people find it too small. At the other end of the height spectrum it seems people under 4 feet 10 inches may find they are having to stretch too far to reach the pedal at the bottom of the pedal stroke, plus the handlebars are in the wrong position. Adjusting the seat height itself is a breeze – you do this by undoing the adjustment knob and sliding the adjustment bar to the height you want. It is also the same process to adjust the seats positioning horizontally. The resistance is provided by a wool felt pad on top of the flywheel. To adjust the level of resistance you turn the red knob at the front of the frame clockwise and lessen your turn it counter clockwise. To stop the flywheel you press the knob downwards and it acts as a brake. The friction provided by the pad is constant helping to provide a fluid ride. There are no markings to indicate levels of resistance on the resistance knob, which is common for many spin bikes. This does make it difficult to know how hard you are pedaling for certain compared to other workouts if the resistance has been changed in between. If you’ve been doing hill workouts it can be difficult to go back to the resistance you had at the start. You can only go by feel and your own estimate of the right amount of resistance. The wool felt pad is long wearing but it does need replacing periodically. The only place I’ve found that you can replace them is from the company direct. The drive for the Sunny Health And Fitness Indoor Cycling Bike is a chain drive like you find on outdoor bikes. Like the chain on those bikes it will need the same amount of maintenance with tightening and lubricating. As expected the noise from the drive is the same as you’d get from an outdoor bike. The chain has a cover which helps with the noise and to protect from banging ankles on the drive and getting lubricant on your skin or workout clothes. If you think the chain noise is more than you want you could consider the Sunny Health & Fitness Belt Drive Indoor Cycling Bike which is a good priced bike with a belt drive. These drives are quieter and there is no need to lubricate on an ongoing basis. There is a difference between this bike and outdoor bikes. You can’t coast like you can with the outdoor ones. When the flywheel is turning the pedals keep on turning. The pedals only stop when you slow them down carefully with your feet or use the resistance knob to stop the flywheel. This is like many indoor cycles and spin bikes. The pedals have toe clips and adjustable straps which you slide your feet into. They are made for use with sport shoes or sneakers. We call them sneakers or tennis shoes). They won’t fit spinning shoes or outdoor bike shoes. It is my understanding from the company that you can change the pedals for other standard bike pedals. If you ride a regular bike you may notice that your feet are wider apart on this bike than you are used to as the pedals are set further apart. This distance is known as the q-factor. For this bike it is approximately 7 1/2 inches. As a rule the bigger this distance the less efficient is your cycling. It is something keen cyclists are aware of because it can cause them to strain and may result in an overuse injury but that is not something that has been reported by those using this bike regularly. The seat is larger than a standard bike seat and is to some people’s liking but not all. Most spin bikes come with seats that are uncomfortable to most people because everyone has their own preference as to what is right for them. Unlike most spin bikes you can’t change the seat for another one as the seat fittings on this bike are not compatible to standard bike seats. (I’ve asked company to confirmbut it can be changed according to the company with standard bike seats). If you do find the seat is too hard for your liking you can try padded bike shorts or a gel seat cover to help the situation. Although many do get used to it over time. The bikes is not quiet but it isn’t that loud. You can hear a shushing sound from the resistance pad and a small amount of noise from the bike chain. Anything more than this may indicate that the bike requires some maintenance and if you need help with that you can call Sunny as they can help. The noise from the bike isn’t enough to force you to turn the TV up to hear your favorite program or to follow along to a spinning video. You can also hold a conversation at normal volume with someone. If you have children you are unlikely to wake them even if they are in the room next to you with the door open. Also it makes a good cardio workout choice for an apartment on the second floor or above due to the lack of noise and pounding you get with a treadmill. The bike is going to generate dust particles and may drop lubricant too. You may want to consider placing the bike on a rubber mat to protect your floor from being damage and any dirt. The handle bars are a basic design but they do give you the option to put your hands in the standard spinning positions of next together in the center, at shoulder width or at the ends of bars for when you are standing on the pedals climbing and/or sprinting. The bike has a small footprint of 22 inches wide by 32 inches long with a height of 45 inches. It can be stored out of the way in a cupboard or under the stairs or in a corner if you are short for space like you may be in an apartment. The bike has small transport wheels at the front of the bike. The bike weighs 61 lbs but it doesn’t take too much effort to tip the bike up on to them. However, due to the wheel size it can be a bit hard to maneuvre the bike on them especially through thicker carpet. This does cause some issues with moving the bike and it makes it so you have to hold more of the weight than you would with better transport wheels. Everything you need to assemble the bike is included, even the tools. Most of the assembly has been done in the factory with the frame, chain drive and flywheel already together. You need only add the seat, handlebars, console, resistance knob, base and pedals. It normally takes between 30 and 60 minutes. The company has made the assembly easier by putting the parts and hardware in their own separate bags and labeling them so you know exactly which piece of hardware to use at each step without having to guess or measure the length or count the pieces to determine which is which. The shipping weight is 67 lbs and the assembled bike is 61 lbs. The weight can make it difficult to move and hold in place for one person so two people are advised. However, many people do manage to do this on their own. It is unusual to see a console on a bike at this price. It is basic but can be used to track your workouts and performance over time. You do need to manually record information somewhere as it does not store the results nor can you upload to the internet. Even bikes with a console that cost much more like the Schwinn IC2 and Keiser M3 Plus don’t store or upload your information to the internet. The Keiser M3 Plus does give you the option to track your heart rate when you have a heart rate monitor strap and you can see all measurements at the same time. It tracks time elapsed, current speed, workout distance and calories burned. Apart from the time elapsed the measurements are estimates but they are useful for comparison and setting yourself targets to achieve. In particular calories won’t be accurate as it does not take into account your weight nor how much resistance you are pushing against but are estimates based on speed and distance traveled. The LCD screen only shows one measurement at a time. It can be seen easily while you are cycling. You can set the computer to show only one of them throughout your workout or have it scroll through them. This is selected using the mode button. You can also hold the button down for 4 seconds to reset all readings to zero. If you need a short break from cycling the computer will stay on for 4 minutes before it switches off. The console takes 2 AA batteries which are included. They are easy to replace when the screen starts to dim. It does not include any automated workouts but most people either come up with their own or follow along to a DVD or Youtube video. This is a no-frills bike and so there are no accessories apart from the console talked about above. This does help to keep the cost down. It’s a shame they couldn’t add a water bottle holder. Instead, you can place water on a table next to you or you could buy a basket to fit on the handlebars or you could do what some customers mention they have done in their reviews which is to add one to the frame. I’ve read through most of the customer reviews online and the majority have very positive things to say about the bike. As expected they like the price, the ease of assembly, that it comes with a tracking computer and that you get a good solid stable ride from it. There are some concerns about the seat not being kind to the sit bones but that is to be expected with any bike. It would be good if it came with a place for a water bottle and some where to put your MP3 player but these are little things and can be worked around by putting a cage or mount on the bike, or for the water bottle you can place it on a table next to the bike. This is a very affordable bike for those on a strict budget. You don’t get everything you would with a more expensive bike like adjustable handlebars or a heavy flywheel but what is does provide it does well for the price. It is a well made bike. This bike is hard to beat for the price and is ideal as a starter bike. It’s great for those who are on a budget and want to get in some exercise from the comfort in their own home. Serious spinners and cyclists are likely going to find that it is not right for them with handlebars not being able to be moved and with a flywheel weight of 22 lbs. They are likely to feel uncomfortable and not be challenged enough. A better bike for those who want a bike that they won’t outgrow as they become more proficient or serios spinners is the Keiser M3 Plus. It is more expensive but you are getting a bike that is used in gyms across the country and you can set resistance to specific levels. It use magnetic resistance and has belt drive so it is one of the quietest bikes around. This budget priced spin bike is well liked by users. It gives a good ride and doesn’t move around or wobble when riding it hard or standing up. You can get a good low impact workout, get fit and burn up some calories without breaking the bank to do it.